Ever since I got a new computer with Windows Vista and Office 2007, I've received a constant stream of "bad news" emails via Microsoft Outlook. I know, I know, I could shut them off but it also keeps me up to date on what's going on outside the Roxiticus Valley. I have learned a lot, including the various signals that can be sent from a men's toilet stall in the Minneapolis airport...where else would I learn those things? Last night I got the news that Michael Jackson is facing the forced sale of Neverland unless he catches up on his mortgage payments....some $25 million worth. Which is another way of saying that, while the sub-prime mortgage crunch has hit the Roxiticus Valley hard, bad credit is a reality for our neighbors and millions of Americans, including Michael Jackson. This makes it tough for some folks to get back on their feet and build a secure financial future for themselves and their families. Roxiticus Desperate Housewives has learned that there are lenders who are willing to give those with bad credit, including Michael Jackson, a second chance (unlike most mothers of young boys that I know). BadCreditOffers.com is a website where people with bad credit can compare mortgages, credit cards for bad credit, car loans, personal loans, etc. So, Michael, we know you're BAD.... and so is your credit. The site's "bad credit credit card" section lets you compare up to ten (10) of the top credit cards on the market for bad boys like you and provides links to their online applications. Michael Jackson (and my fellow Roxiticus Valleyans) can apply for the offer that's right for him, and by making payments on time you can all start down the road toward saving Neverland and rebuilding your credit. Today I joined a service called Smorty where you blog for money. Apparently Smorty asks me to write about their advertisers on my Roxiticus Desperate Housewives blog with a link back to the advertiser's web page. It seems harmless enough, certainly beats those awful people who leave advertising links in my comments section without my permission, and Smorty will pay me at least $6.00 per post for entertaining you with various stories about their advertisers. I will leave it to our loyal Roxiticus Desperate Housewives readers to determine whether we are somehow "selling out" here. Please vote via the comments section below. I bet if you click on the link here, you can blog for money, too. Ever Wonder Where Homeless People in NYC Get Their Shopping Carts? This question got the staff here at Roxiticus Desperate Housewives wondering where homeless people in Manhattan (or, more importantly, someone with a home, a computer, and a web site) would find shopping cart software to create your own online store. The answer is Ashop Commerce, a leading US provider of complete e-commerce solutions that enable web merchants to sell online. It looks like an easy way for bloggers or other web site operators to accept credit cards on your web site. I will be looking for your suggestions (via the comments area below) on items we might start selling on this site. Autographed photos of the Roxiticus Desperate Housewives? Personal blog posts? Hot secrets? So, dear RDH readers, I have accepted the opportunity from our friends at Smorty to tell the Roxiticus Desperate Housewives readers about a leading provider of ecommerce software for your web site. I remember one time when Melissa & I were at the Roxy in L.A., checking out some hair band from the late 80s/early 90s and it got to be 11:00pm, which is apparently late on the West Coast, and the emcee came on and told us "you don't have to go home, but you can't stay here." Thus the titular inspiration for this post. The Roxiticus Desperate Housewives site is not set up for e-commerce, but if you're looking for a leading provider of hosted ecommerce software to create your own online store, whether you are weaving your own baskets or selling music or sports memorabilia, look no further than Ashop Commerce. Based on a little bit of my own Internet research, I've found that there seem to be many providers of shopping cart software out there, but you want to find one that's basically "plug and play," supported by solid customer service just in case something goes wrong. Ashop Commerce offers a complete solution for merchants to sell online. It looks like an easy way to accept credit cards on your web site. Let's see.... what could we start selling here? Roxiticus Desperate Housewives souvenir t-shirts with my picture? Please post your suggestions in the comments area below. Romney Suspends Presidential Campaign. Perhaps he'll get the nod as McCain's running mate. My older daughter always requests The Bernards Inn for her birthday dinners, so we were there recently to celebrate. They seated us by the piano player as requested, but I have to say that this year's piano player somehow wasn't as much fun as last year's guy….he did play Happy Birthday as expected, but I couldn't tell whether he was flirting with one of the waitresses or just bored. The birthday girl had a steak and French fries and gobbled her dinner happily and hungrily. I'm sure we'll be back to The Bernards Inn for her birthday again next year. Her sister (who always chooses the Limestone Café in Peapack for her birthday dinners, both for the rack of lamb and the birthday cake) was less adventuresome, sticking to French fries and plain pasta. Rex enjoyed the quail appetizer and suckling pig entrée. I had an amazing tuna sashimi appetizer and a not-so-great buffalo steak, with my palate much more likely to blame than the chef. I had never tried buffalo meat before and wanted to try something different. The waitress warned me that I might find it more "gamey" than beef steak, and I have to say that I'm not sure I have an appropriate understanding of gamey…I found that my buffalo steak tasted like the calves liver (and onions) that my mother would try to get me to eat every few years when I was growing up. The initial taste of the buffalo steak was delicious, but it left a liverish aftertaste in my mouth. No more buffalo for me….I'll stick with the lobster next time we go to The Bernards Inn. To accompany our meal, Rex and I both had "flights" of wine, which was either a special, or something The Bernards Inn has recently introduced. We both started with a flight of Chardonnays, then Rex had a flight of Cabernet and I had a flight of Pinot Noir. Fun for a change of pace from sharing a bottle. Both girls enjoyed the molten chocolate cake for dessert, and I enjoyed a trio of chocolates. We'll be back…. According to my MSNBC news feed (these constant comment e-mails that remind me what's wrong with the world on an hourly basis), "James C. Dobson, a longtime conservative leader, greeted Mr. McCain on primary day with a statement announcing that he would under no circumstances vote for Mr. McCain in November." So, James, when you go to the polls, will you be voting Democratic? Writing in Ross Perot? While some of us might have preferred a businessman like Mitt Romney, get over it and keep that hideous Hillary out of the White House! James, James, James (and Rush, Rush, Rush)....may I just remind you that, no matter which Democrat you pick, THEY WILL ALL RAISE YOUR TAXES. If you'd personally like to pay more taxes, the one convincing tidbit I picked up from W's State of the Union is, "the United States treasury accepts checks and money orders." Be our guest. Went to Stirling Fine Wines in Stirling, NJ today for their Red Tag Sale. Then we came home and drank wine while the girls made Valentines for all their classmates. Now, have I had too much wine or is that picture on its side? 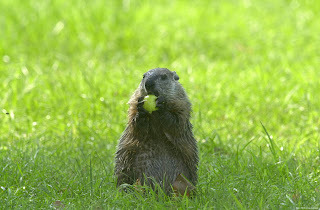 I'm getting my own Groundhog...Punxsutawney Phil saw his shadow this morning and dealt us all six more weeks of winter. I'm going outside to discuss this matter with one of the guys who raids our tomato garden every summer. OK, I've been out to the backyard for a Groundhog's Day 2008 interview with Roxiticus Roxy, our very own Roxiticus Valley Groundhog. She says, "the clouds are so thick in the sky I can't get a glimpse of the sun, never mind my own shadow. For those of you fortunate enough to live in the Roxiticus Valley (including Mendham, Chester, Bernardsville, Far Hills, Peapack-Gladstone and Bedminster, NJ), Spring is Here! Now get online and order me up some heirloom tomato plants for my family to enjoy this summer." As one of our visitors has noted, Canada apparently has its own answer to Punxsutawney Phil. His name is Wiarton Willie and he did not see his shadow today. Here is his web site. The Somerset Hills Education Foundation’s mission is to promote and provide education opportunities through innovative programs and projects for the benefit of the students of The Somerset Hills School District (Bedwell Elementary School, Bernardsville Middle School and Bernards High School). Read more on their web site at http://www.shefnj.org/index_AboutShef.htm. SHEF hosts its fifth annual Chili Cook-Off benefit on March 29th. Cakes, cookies, crumb cake, croissants, lots of baked treats at CocoLuxe Fine Pastries, 161 Main Street in Peapack, NJ. Here's a link to their web site, or you can reach them by phone: (908) 781-5554. Limestone Cafe, 89 Main Street in Peapack. Limestone doesn't seem to have their own web site, but you can call them for reservations. Phone number is 908) 234-1475.